All of these Thursday that have passed me by and I have yet to take advantage to make one a "Throwback Thursday". Today, I have the opportunity to do a little Throwback to 2001. It was my 3rd trip to Walt Disney World. I was almost 20 years old, and it was Spring Break in my college days. My parents decided to take myself and my cousin, Shannon, on a trip to Universal Studios Orlando and Walt Disney World. AWESOME!!! I'm pretty sure this is the trip where I was on the plane with my short hair up in crazy pig tail things on top of my head. The airline attendant walked by and reminded my mom that we were seated in an emergency exit row, and wanted to confirm that I was at least 12 years old. 12?!?!?! We all looked at her and my mom blurted out "SHE'S 20 YEARS OLD!" I've hear looking younger, but wow.... 8 years younger. Anyhoo - fast forward a bit through the trip. We noticed folks walking around with lanyards and such around their necks, weighed down by numerous pins. Then we saw the carts selling these various shiny pins. We checked out one of the carts finally and asked what the deal was with these pins. That's how I first learned about Disney pin trading. I was debating joining the craze. I did't know the history, didn't know how long it had been going on, didn't know how long it would last. The Cast Member realizing my hesitation informed me that pin trading had been going on for 2 years, and it wasn't going anywhere. Okay! SOLD! Sign me up. What do I do? So, we bought a lanyard and a pin or two. The Cast Member who sold it to us, also gave me my first official pin trade: a very cool musical Mickey conductor. I acquired a few more pins throughout the trip, including one from the Caribbean Beach Resort where we were staying. And of course, I HAD to have an Indiana Jones pins, especially since I was finally on a trip that I was old enough to be in the Indiana Jones stunt show and was selected to be in it! And here we are, posing under the Tudor Lane sign ('cause my maiden name was Tudor) and my pin lanyard around my neck. Now, fast forward 12 years. It was back to Walt Disney World for my 4th visit, and my littlehead's 1st visit!! What did I make sure he received for his birthday prior to the trip, his own pin trading starter set! 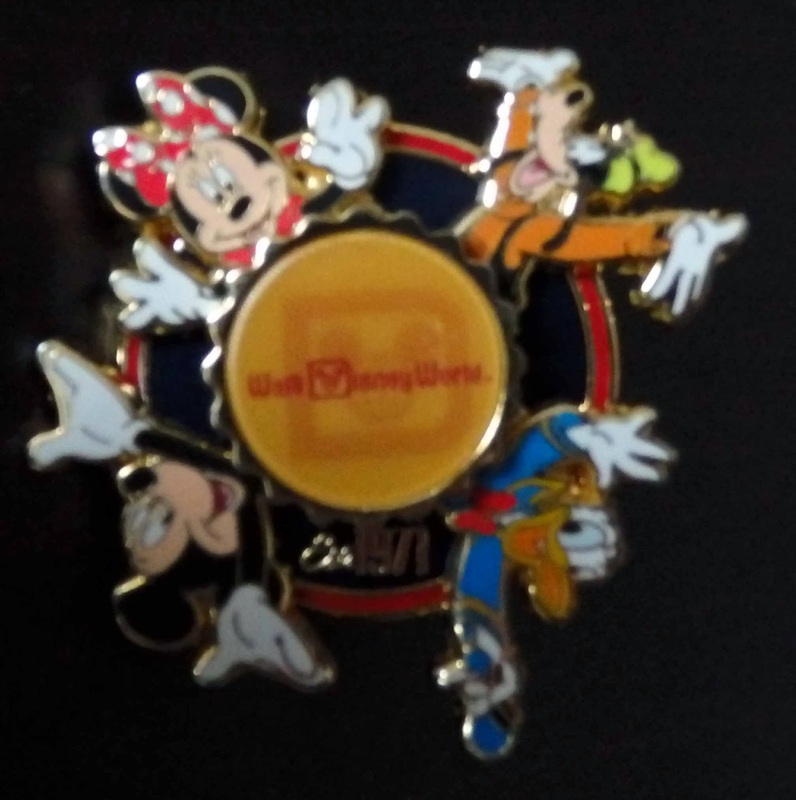 It came with a lanyard and four 2013 pins representing the four WDW parks. 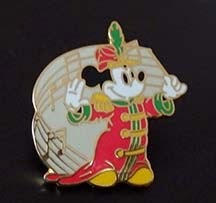 Littlehead's first "trade" was the very pin I received as my first "trade" - the musical Mickey conductor. The other pin he received as part of his Disney theme bday gift was a really cool spinner with Mickey and Friends. We acquired a few more pins for trading purposes. When we arrived in WDW, the littlehead and I were ready to do some serious trading. We ended up with some great pins. Some traditions had to be repeated. For instance, littlehead was in need of a pin to remind us of the resort we stayed: Caribbean Beach Resort. On the left, if my pin from 2001, the right is his awesome Mickey pirate pin. Yeah, I was way jealous that his is much cooler than mine. But the folks at CBR did appreciate my older pin. 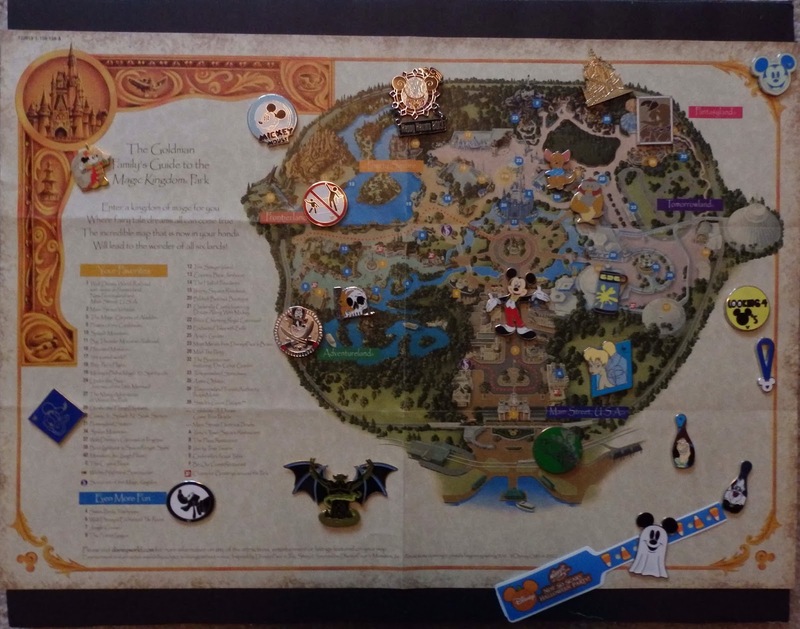 Utilizing two shadow boxes (which happen to be on sale at JoAnn Fabrics), two foam boards from the dollar store, and free customized maps from Disney, we created two awesome pin displays that now reside in the littlehead's room. The Disney customized maps are fantastic! You can select your favorite rides and attractions to be listed on your maps. They will have your family's name on them as well. You can choose from a Character or Classic theme. For these, we chose the Classic theme. The only problem I have with these is that they are double sided. Luckily the two maps I wanted to use for this project are on two different sheets. Above is the Magic Kingdom map display. The littlehead and I sat down with our pins and chose ones that fit in with the Magic Kingdom. We even included our band from Mickey's Not So Scary Halloween Party. This one is a map of all of the Walt Disney World Resort in Orlando. This was a fun one. 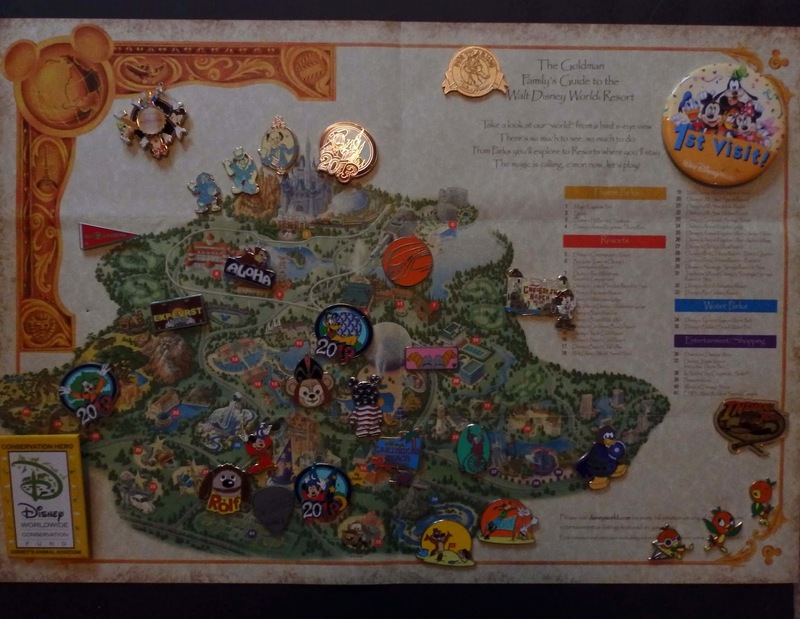 We actually had pins that represented each park. 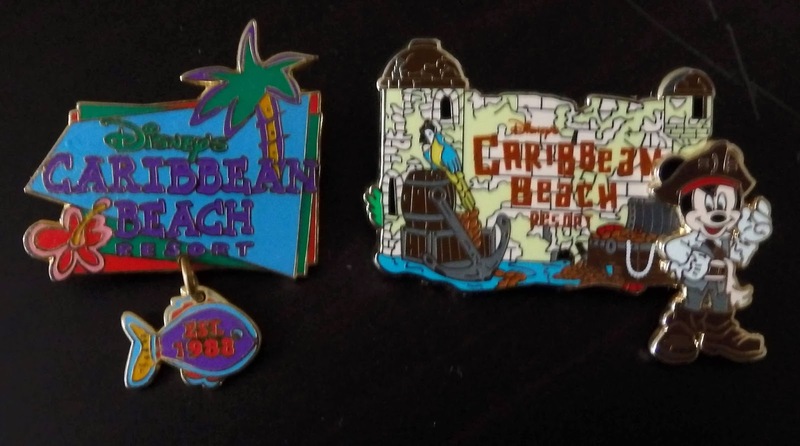 And, our Caribbean Beach Resort pins were a great addition as well. 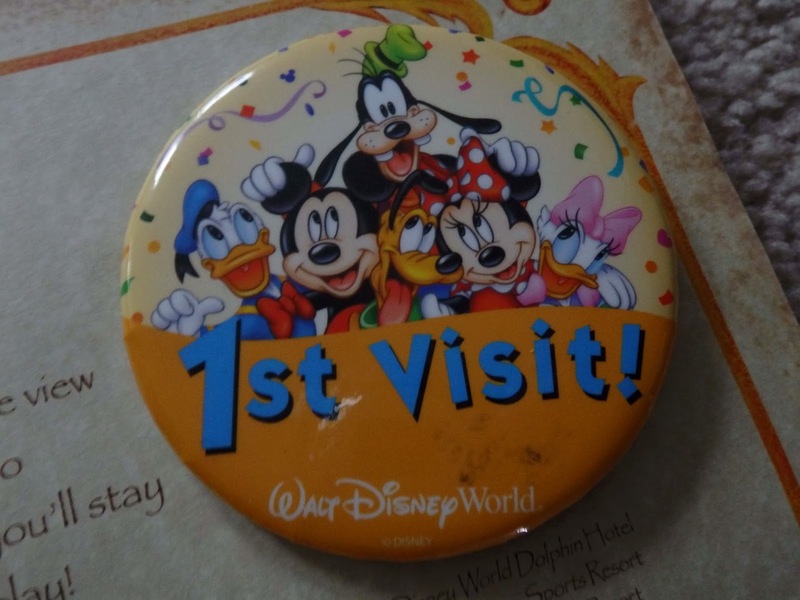 Littlehead's 1st Visit button also found a home on the WDW resort map! 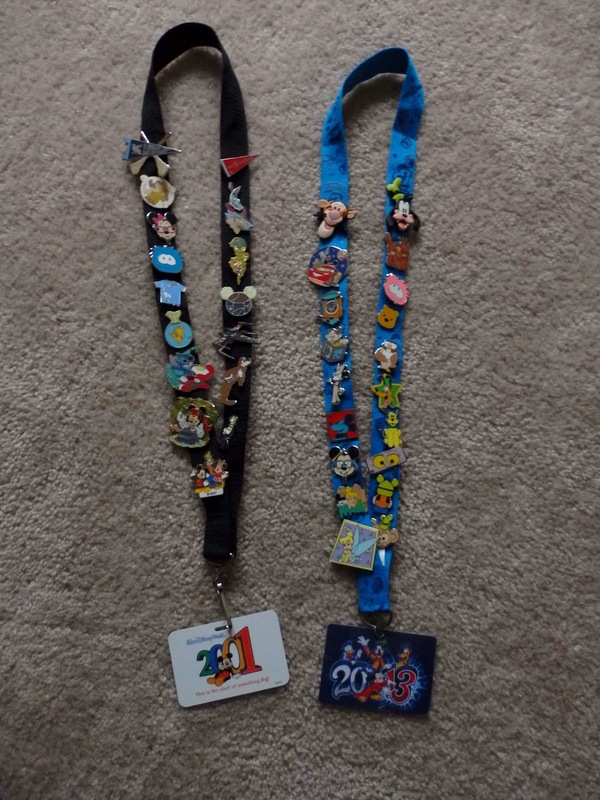 Here are the lanyards, displaying the pins that remain. Yup, we are Disney Pin Collectors (ignore the Ravenclaw Quidditch pin on my lanyard. Besides being a Disney Geek, I'm also a Harry Potter nerd). We are quite proud to be Pin Traders and look forward to more trading in Disney.